Feel free to stop by the IN STOCK page to catch the latest additions! I will be more than happy to make your order according to your wishes! 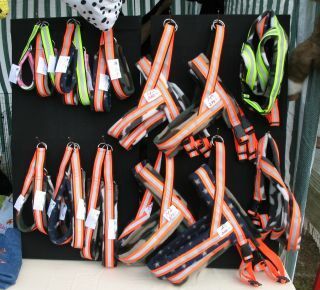 Reflective collars and reflective harnesses. Made of neon orange fabric with a reflective material on top. This is sewn onto fleece material of different colors and motifs. When required, a durable nylon "ribbon" is sewn together with the reflective material. The strong neon colors helps to keep the dog visible in daylight and dusk and the reflective part is highly visible in both dusk and in the dark. I am a retailer for two different types of reflective vests for dogs. The vest is an excellent and reliable way to keep your beloved pet visible in the dark. 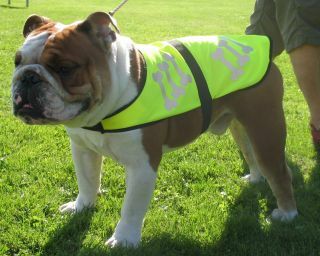 Due to the neon yellow fabric - the dog can wear the vest at all times as a way of increasing the visibility and therefore increasing its safety! ALL dog products are tested by our own dogs for a longer period of time to ensure good quality and good fit. 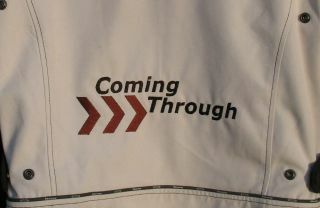 For the "mum" and "dad" I offer an opportunity to get images and words sewn on to their favorite garments! Either you buy and send me clothes of your choice or you can buy the items through me. Examples of what I produce are dog/owners name, kennel names, club names, dog breed and so on. 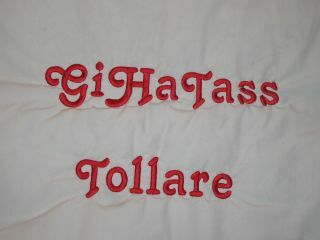 I offer embroidery work on towels, blankets, hoodies and much more. The fabric or garment needs to fit in the sewing machine and I need to be able to fold away any eventual surrounding fabric enough so that I don't stitch the layers together! The minimum demands of fabric quality is "tennis shirts" or similar. Regular T-shirts are too thin and flexible, I need to a fair chance of stretching the material in the sewing frame without stretching it too much! I also offer companies the service of stitching logos all according to wishes and requirements. And why not design your own Christmas presents, birthday gifts, promotional products and much more. I can help you create custom made gifts! Gifts that cannot be found anywhere else.